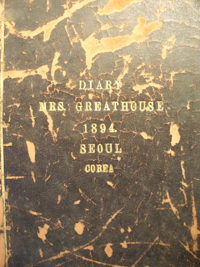 A cover for the personal diary of Elizabeth Greathouse, which shows there was a baseball game in Korea in 1894. While the earliest reference to baseball being played in Korea is thought to be in a newspaper from 1896, an even earlier mention can be found in the personal diary of a Seoul resident from 1894. Similar to the Doubleday myth in America, many still believe that baseball was introduced to Korea in 1905 by an American missionary with the YMCA named Philip L. Gillett. However, while Gillett did promote the game among Korean youth, there are numerous records of baseball being played in Korea far earlier than 1905. The early days of baseball in Korea go back to the late 19th century, when Korea was still the Joseon Kingdom (1392-1910). Despite being referred to by some as the "hermit kingdom," by the 1890s there was a flourishing foreign community in Korea, made up of foreign legations, businessmen and their families, missionaries, foreign experts and government advisors. There were also American military personnel living in the country and stationed offshore. What we now know as Seoul was a walled city called Hanseong, and significantly smaller than the current metropolis. Baseball was mainly being played by the Americans in the foreign community and the games usually took place on what used to be military training grounds near some of the city gates, a few of which still exist today. Accounts of some of these early games can be found in one of the newspapers published at that time. The earliest known published reference to baseball in Korea is in the Saturday, April 25, 1896, edition of The Independent, in the English section. The Independent, published from 1896 to 1899, was the first newspaper in Korea to include an English section and was founded by Philip Jaisohn. In this Saturday edition, there is an announcement about a "base ball" game in the "Brief Notice" section. It is also in the Independent, from a game between the Seoul Athletic Club and a team comprised of members of the U.S.S. Yorktown, that a box score for a baseball game in Korea appears in print for the first time. From the box score we are able to find out the names of the players, some of whom are well-known figures from that time. Three notable names on the Seoul Athletic Club team were Horace Allen, Homer Hulbert and Philip Jaisohn. In addition to these reports in the Independent, references to baseball can be found in the personal writings of some of Korea's early foreign residents. Sally Sill, the wife of American Minister to Korea John M. B. Sill, wrote about baseball in many letters in 1896. In fact, some of what she writes corroborates the accounts from the Independent. In her letters, Sill writes about some of the games that she attended, including the previously mentioned game between the Seoul Athletic Club and the U.S.S. Yorktown team, and also mentions how baseball was becoming more popular than tennis among the foreign community. We can glean from Sill's correspondence that baseball was popular with foreign residents then and that many games were played, with the participants mainly coming from the foreign residents living in Seoul and U.S. military men stationed nearby. While the Independent and Sill's letters have been written about previously, they are not the earliest references to baseball in Korea. The oldest known reference can be found in the personal diary of Elizabeth Greathouse. She was the wife of Clarence Ridgley Greathouse, a judge and foreign resident of Seoul from the early 1890s until his death in 1899. In two diary entries from 1894, Greathouse refers to a baseball game that was played on Oct. 23 near the "East Gate," also called Dongdaemun. There was a military training ground just inside the East Gate, and this location was also given as the site of some of the games played as reported in the Independent. According to Greathouse, she was invited to a baseball game, and while she did not attend, she writes that her son did go to the game. This game took place about a year and a half earlier than the game mentioned in the Independent. While relatively little is known about the origins of baseball in Korea, according to documents related to the foreign residents, it seems to have been quite a common activity in Seoul since at least the mid-1890s. And while we may never know exactly when baseball was introduced, or when the first game was played, we do have a small glimpse into baseball's earliest days in Korea. Patrick Bourgo is a Seoul-based baseball researcher and writer. Follow him on Twitter: @kballhistory.